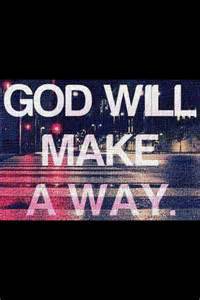 We say at times “Where there’s a will there’s a way” and we know with God all things are possible. In our own will we can find a solution to things, but scripture tells us of times when there seems no way out or an answer seems unattainable that only God can and does make a way where there is no present solution seen. The story of Elijah is one of many times we learn of God taking care of things as when God commanded the ravens to feed Elijah where no food was available. (1 Kings 17:1-6). And Elijah the Tishbite, who was of the inhabitants of Gilead, said unto Ahab, As the Lord God of Israel liveth, before whom I stand, there shall not be dew nor rain these years, but according to my word. And the word of the Lord came unto him, saying, Get thee hence, and turn thee eastward, and hide thyself by the brook Cherith, that is before Jordan. And it shall be, that thou shalt drink of the brook; and I have commanded the ravens to feed thee there. So he went and did according unto the word of the Lord: for he went and dwelt by the brook Cherith, that is before Jordan. And the ravens brought him bread and flesh in the morning, and bread and flesh in the evening; and he drank of the brook. When Peter was asked if his master pays tribute, Jesus gives a great lesson how the kings of the earth gather taxes from strangers and not from their children. Jesus then shows the miraculous and a very different way to pay tribute by telling Peter to go catch a fish and find in its mouth a piece of money to pay for them both. (Matthew 17:24-27). And when they were come to Capernaum, they that received tribute money came to Peter, and said, Doth not your master pay tribute? He saith, Yes. And when he was come into the house, Jesus prevented him, saying, What thinkest thou, Simon? of whom do the kings of the earth take custom or tribute? of their own children, or of strangers? Peter saith unto him, Of strangers. Jesus saith unto him, Then are the children free. Notwithstanding, lest we should offend them, go thou to the sea, and cast an hook, and take up the fish that first cometh up; and when thou hast opened his mouth, thou shalt find a piece of money: that take, and give unto them for me and thee.